Trabeculectomy is a surgery which lowers the intraocular pressure inside the eye (IOP) in patients with glaucoma. This is done by making a small hole in the eye wall (sclera), covered by a thin trap-door in the sclera. The fluid inside the eye is known as aqueous humour and it drains through the trap-door to a small reservoir just under the eye surface, hidden by the eyelid. The trap-door is stitched in a way that prevents aqueous humour from draining too quickly. 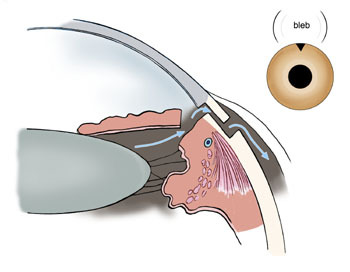 By tapping aqueous humour the trabeculectomy operation reduces the pressure on the optic nerve and stops or slows down damage and further loss of vision in glaucoma. A type of glaucoma is otherwise known as acute glaucoma or narrow edge glaucoma. It is substantially uncommon and is altogether different from open-angle glaucoma, in which the eye pressure increases rapidly. This condition happens when the drainage channels in the eyes get blocked or covered. Normal eye pressure ranges from 12-22 mm Hg, and eye pressure of greater than 22 mm Hg is considered higher than normal. When the IOP is higher than average, but the person does not show signs of glaucoma, this is referred to as ocular hypertension. With glaucoma, the iris isn't as wide and open as it ought to be. The external edge of the iris groups up over the thin drainage canals, when the pupils expand too much or too rapidly. Everybody is in danger of glaucoma; however, some people are at more risk than others. Blunt trauma to the eye or eyes. Hypertension, which increases the eye pressure. Trabeculectomy surgery is often performed under local anaesthesia or general anaesthesia. A patient who is having the surgery under local anaesthesia is awake during the operation. The eye is numbed first with eye drops, and then an injection of anaesthetic is administered around the eye. The anaesthesia itself may cause some mild discomfort; a slight sensation of pressure as the analgesic is delivered. The injection numbs the eye, preventing not only pain but also excessive eye movement during surgery. The patient will be aware of the surgeon working around the eye. In case of any pain or discomfort, the patient may calmly alert the doctor. The patient may also hear the surgeon speaking to the nurse and other members of the surgical team.